Antonio Valdes Y Su Marana - "De Ojos Como Zarzas"
This is not normally what I would review but I was pleasantly surprised. Although the biography puts this into the progressive rock category, it is a mixture of Spanish flamenco-gypsy music but with some great jazz style material. The opening track starts out as pure gypsy-flamenco music but then the clarinet solo comes in and the bass playing changes to a very jazzy style and then they take it back to the beginning again. 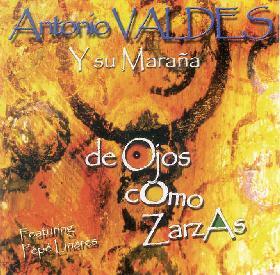 While the CD maintains a distinct Spanish style, some tracks like "Complete Mandingue" are pure jazz. "Aquelarre" has some great acoustic guitar like Al DiMeola might play. I would have to say the Antonio has successfully created the first flamenco jazz CD that I have ever experienced.